Functions with a stainless steel, single point, approved load cell made according to OIML R60 standards, with protection against dust and moisture according to IP66 standards (350 Ohm input resistance). Bearing structure which may be fixed to the wall fitted with a quarter-weighing hook. 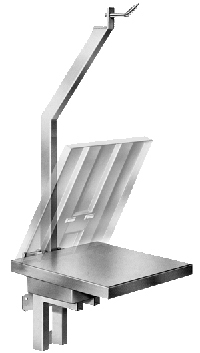 Folding stainless steel loading surface, fitted with a fall-prevention safety piston. Shielded 3m long 6-pin cable with connectors for connection to the weight indicator. Connection to the indicator and calibration with CE-M 3000e single range or 3000e+3000e dual range approval (depending on the indicators used).